This indicator depends on the variety of ways which Royal Panda offers his clients to contact customer support and the speed with which it solves a problem, as also the overall customer experience. The reputation rating of Royal Panda is based on its popularity in online space - comments, user ratings on other sites, and social networking likes. 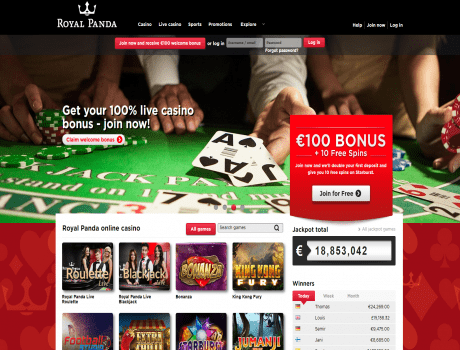 Royal Panda like to give new casino players a warm welcome so to ensure you feel right at home, they will match your first deposit up to €100. That means twice the online casino fun while you explore their great range of video slots, table games and their live casino. Bonus is not available for players who make their first deposit using Neteller, Skrill or Paysafecard. Players from the following countries are eligible for the free spins upon creating their account: United Kingdom, Switzerland, Austria, Germany, Sweden, Finland, Norway, New Zealand, Netherlands, Japan.